All are invited to a reception for the exhibit Tuesday, October 6th from 4-6 pm, with a short program at 5pm. (Details below) The exhibit closes Monday October 12th. Open Monday – Friday 8:30 a.m. – 4:30 p.m. Parking is available behind the building in the Gortner Avenue Ramp. 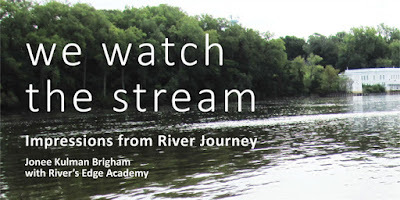 The exhibit includes artworks and documentation of the River Journey project including photographs, maps, reflective writing, and objects used for water interactions. The project and exhibit is made possible through a fellowship from Institute on the Environment, and the support of River’s Edge Academy, many community partners, and Full Spring Studio.